The famous Muar Otah is now available in Singapore from Savory Delights! Located in the north-western state of Johor in Malaysia, Muar is famous for many of its local food, with Muar Otah being the most well-known throughout Malaysia and Singapore. It is especially popular among Singaporeans visiting Muar and a must-buy product to bring home. Muar Otah is unique as it differs from the usual banana-leaf or coconut-leaf types available commonly in the market place. 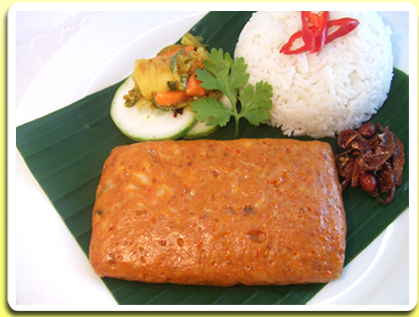 Our authentic Muar Otah uses the finest and freshest ingredients and spices with mackerel fish slices blended in the traditional homemade recipe. No MSG or preservatives are added. The freshly made Otah paste is chilled and will remain fresh for up to 6 months when kept frozen. Our Otah products are certified "halal" in Malaysia. The Muar Otah can be cooked in various ways – steam, bake, grill, microwave, fry or barbecue – and the taste is simply yummy, thus making it ideal for all occasions. With the flexibility in serving, Muar Otah can be prepared not only as a savory oriental meal or snack, it can also be used as essential ingredient for puffs, pies or buns. In addition, it can be blended into western menu when served in sandwiches, burgers, pizzas, baguette or even Japanese sushi.